Retail prices for individual cuts of lamb. 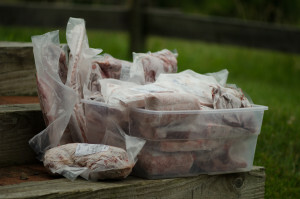 Do you have enough freezer space for a half (~ 20 lb of lamb) or a whole (~40 lb of lamb)? SAVE (~15%) by ordering by the half or the whole – and choose your preferred chop thickness/ boned/boneless status of cuts! If you don’t have the freezer space – consider purchasing individual cuts, flash-frozen and cryo-sealed, by our USDA-inspected butcher. Available only while supplies last; price list available here. We pride ourselves on 100% grassfed lambs. Our lambs are NEVER fed hormones or antibiotics (for purposes of promoting growth). Unlike the case with supermarket lambs, or even many lambs raised locally, “100% grassfed” means that our lambs are not fattened on grain – not from weaning to the day they’re processed. Not only is this better for the environment – it also produces meat that is healthier to consume (lower in fat and calories, higher in omega-3 fatty acids, and higher in conjugated linoleic acids). These benefits disappear when animals are “finished” on grain. More information about the health benefits of consuming meat from 100% grassfed animals is available here. Our lambs are available as retail cuts; save by purchasing by the whole or half lamb. Feel free to split a whole or half lamb with a friend! A whole lamb (~90-120 lb live weight) represents ~45-60 lb hanging weight (= meat + bones), so a half lamb represents about 22-30 lb hanging weight. You get to specify how your lamb will be cut: do you prefer rack of lamb, or chops? Whole leg for roasting, or butterflied leg of lamb for grilling? Shoulders for roasting, grilling, making your own sausage, or stew – or do you like LOTS of ground lamb? Do you want bones for soup stock? Lambs will be available in December (ram lambs less than one year of age). On occasion we will also have a few “slow growing” ram lambs that we hold over for processing in the early spring, just in time for the spring holidays. In future we may offer excess ewe lambs (just over one year of age) in May-early June (not available at present as we grow our flock) or mutton (which has an undeservedly bad reputation; it’s actually quite flavorful, just not as tender as lamb, so better reserved for long cooking times, stewing, or as ground meat). We will begin taking reservations for lambs on a first come, first served basis in the fall. We currently ask $3.25 per pound (on a live weight basis, not including processing fees); this corresponds to approximately $8.00-$8.50 per pound on a hanging weight (meat plus bones) basis. If you compare this with typical farmer’s market prices, you will find you are saving considerable money by buying a whole or half lamb. You also have confidence that it has been raised on grass/hay in an environmentally sustainable manner. A $50, nonrefundable deposit (for a whole lamb; $25 for a half lamb) will be required by November 1 to hold your lamb; at this time we request that you complete a cutting order (see links above). We are happy to help you in navigating the cutting order if this is your first time working with one. send an email to luckylanefarm@gmail.com to reserve a lamb and to request a cutting order. Note that we anticipate selling out by late October. send the completed cutting order and deposit to the address indicated on the cutting order by November 1. (If we do not receive your deposit on time, we will turn to the next person on our waiting list). We will notify you when your lamb goes to the butcher in early December (date for 2017: Dec. 1). Your lamb will be available approximately two weeks later. At that time please remit the balance of the amount due for the lamb to us. We will notify you when your lamb is ready for collection. It will be cut to your specifications, vacuum sealed in plastic (for better storage in your freezer), and flash-frozen. You can collect it from the butcher in Manchester, MD. If travel to Manchester MD is a burden, you can collect it from our farm for no additional fee, if arrangements are made in advance. A 100-lb lamb (live weight) will typically yield close to 50 lb of meat (the so-called “hanging weight”). This might include two legs (whole or cut in half; butterflied, bone-in, or boned and rolled); one shoulder roast and four packages of shoulder chops; 14 1¼” loin chops and 16 1¼” rib chops, more if you elect thinner chops; 4 (two packages) of lamb shanks; two packages of lamb spareribs, and four pounds of ground lamb. The yield of ground lamb is greater if you prefer to have shoulders, shanks, and spareribs as ground lamb. You might prefer to receive some or all of the rib chops as rack of lamb instead of as rib chops. If you wish, you can also obtain offal (lamb tongue, heart, kidneys, spleen, and liver), along with lamb bones for soup. A detailed breakdown of the number and sorts of cuts you might expect from a whole lamb is available here. You may find that you’re not familiar with how to cook some of these cuts. We are always happy to provide you with healthy and delicious recipes! If you’re concerned about whether you have enough room in your freezer to store an entire lamb, the photograph below should give you an idea of what to expect (from a 108-lb lamb). For perspective, the plastic container is 16” wide x 11.5” deep x 7” high. A whole lamb requires approximately 2 cubic feet of freezer space, and will fit in the freezer compartment of most standard freezers. For comparison, a milk crate is a little over 1 cubic foot. We do not allow on-premise slaughter of our lambs. Nor do we allow our lambs to be purchased live for transport for off-premise slaughter. We cherish our animals, and wish to ensure that they are slaughtered with minimal stress in a USDA-approved facility.